In 2012, the United Nations purchased $431.5 million worth of goods and services from Sudan, mainly for construction materials and services, and transport services. As a result, Sudan — for the first time — became the eighth-largest supplier to the global body, according to the Annual Statistical Report on U.N. Procurement. Sudan is not the only developing country that has become a top supplier to the United Nations. Kenya has similarly made the list for the first time, providing $416.3 million worth of building materials, and transport and construction services. Kenya is now the ninth-largest supplier to the United Nations. Overall, four of the United Nations’ top 10 country suppliers are developing nations and one is an economy in transition. India, which has been in the list since 2000, tops the roster. It is now the second-largest supplier to the global body, providing $875.3 million worth of goods and services. India supplies mainly vaccines, pharmaceuticals, medical equipment, food supplies, and consulting and information technology services. For the fourth consecutive year, Afghanistan is among the top suppliers to the United Nations. After dropping to $537.3 million in 2011, U.N. procurements from the Asian country surged to $692.5 million in 2012, making Afghanistan the third-largest supplier to the global body. The United Nations procures mainly construction, demining and security services in Afghanistan. Russia rounds up the top 10, providing $403 million worth to the United Nations in 2012. Procurements — which consist mainly of air charter and operations services, and food supplies — plummeted 32.5 percent from $597.2 million in 2011. Procurements from developing countries have grown steadily since a General Assembly resolution in 2007 renewed a 2005 call for U.N. organizations to increase purchases from developing countries and countries with economies in transition. As a result, such orders have increased 29.2 percent from 2008 to 2012. Last year, the United Nations bought $483 million more in goods and services from these countries than it did in 2011. Further, the share of procurement from these countries rose from 59.7 percent in 2011 to 61.7 percent in 2012. In contrast, the share of procurement from developed nations dropped from 39.2 percent to 38.3 percent in the same period. 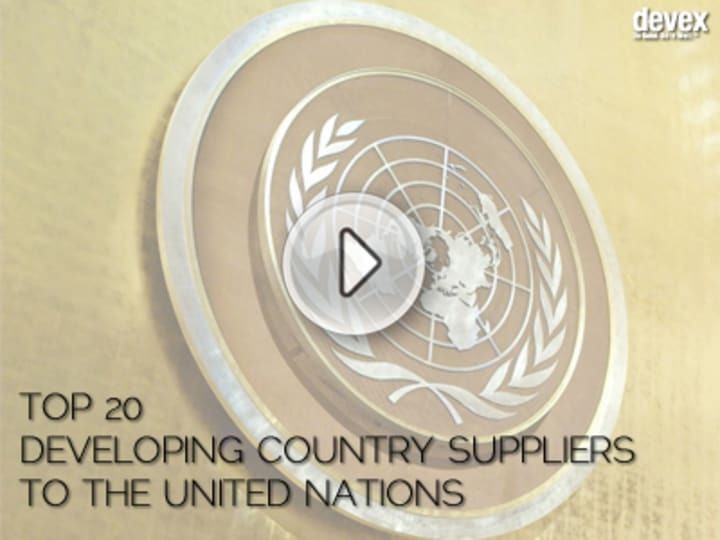 Check out this slideshow to see the United Nations’ top 20 suppliers from developing nations and countries with an economy in transition. U.N. organizations purchased 7.7 percent more goods and services in 2012, with total volume increasing from $14.3 billion in 2011 to $15.4 billion last year. While goods purchases dropped 3.7 percent, procurement of services jumped 18.8 percent. Online — the future of procurement?